From the man the storm came fast department... DJ Nu-Mark of Jurrasic 5 fame will be @ The Parish tonight, Aug 31st. With the Austin own funky Flyjack and DJ Manny. 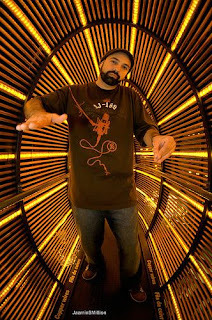 DJ Nu-Mark (born Mark Potsic), also known as Uncle Nu, is a Polish-Iranian-American hip-hop DJ mostly known for his membership of Jurassic 5, an American five-piece hip-hop crew consisting of one DJ and four MCs. DJ Cut Chemist was also part of the original group but left the band in 2006 to pursue a solo career. DJ Nu-Mark is a renowned hip-hop producer and DJ. His discography includes all four Jurassic 5 album releases (Jurassic 5 LP, Quality Control, Power in Numbers and Feedback), a Sequence Session Mixtape CD entitled Hands On and his most recent project, collaborating with Pomo to create Blendcrafters. He also collaborated on several tracks of the popular "Mushroom Jazz" series.